An out-of-control arsonist seeking revenge. A fireman and a detective on his tail. 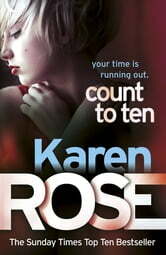 COUNT TO TEN is a compulsive thriller, part of the Chicago series, by Sunday Times bestseller Karen Rose. Abandoned years ago to the foster-care system, two young brothers end up in an unimaginable hell and when one dies, the other vows revenge on those responsible. Chicago Fire department veteran Reed Solliday immediately knows he needs help when an autopsy reveals that a young girl found in the wreckage of an explosion was raped and murdered before fire ripped through the house. Each layer in the story unfolds as you learn about the characters in the story and try to solve the mystery. Well written and " I can't put this book down just yet" read. Mia is one of my favorite characters from this series, I would love Karen Rose to do a couple more books featuring Mia, Dana, Olivia, Caroline and their partners and children! The suspense is fantastic, the storyline is solid, Karen Rose is one of the best authors out there! Tense thriller with romantic undertones but gripping right through! Will read more from this author!